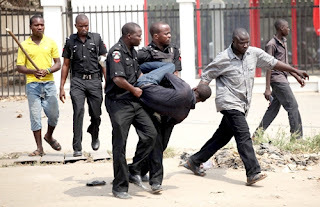 A Minna Magistrates’ Court, has remanded three students in prison custody for allegedly beating and detaining their fellow student on suspicion that he stole an HTC handset, valued N32, 000. The accused persons are, Jibrin Attahiru and Idris Usman, both of the Ibrahim Badamosi Babangida University, Lapai and one other student, Shehu Abdullahi, from Ahmadu Bello University, Zaria. The three students were arraigned on a two-count of criminal conspiracy and culpable homicide, contrary to Sections 97 and 221 of the Penal Code. The Police Prosecutor, Sgt. John Steven, told the court that one Mohammed Aliyu, the Chief Security Officer of IBB University Lapai, reported the matter at the station on July 24. Steven said the accused persons suspected one Mubarak Sanusi, a student of the same institution, to have stolen an HTC handset, valued N32, 000 belonging to one of them. He said the accused persons picked up Sanusi and took him to their lodge, where they beat him up and detained him inside the toilet. According to him, Sanusi was said to have died on the way to the General Hospital, Lapai, the following day. When the charge was read to them, they all pleaded not guilty. The prosecutor, thereafter, prayed the court for an adjournment, as an investigation into the matter was still ongoing. In her ruling, Magistrate Fati Auna ordered the accused persons to be remanded in prison and adjourned the matter until Sept. 3.